The Olympics have a tradition of spectacle and pageantry. In Barcelona at the 1992 Olympics and Paralympics, the two opening and two closing ceremonies were among the largest and most complex stadium shows ever created. Laurence Estrin of BEST AUDIO was the Ceremonies Audio Consultant and Director of Communications. Responsibilities covering all aspects of communication and sound started 18 months before the first event when he developed show requirements with the Olympic Ceremonies staff. A cast of thousands and over 12,000 athletes participated in the show. Organizing the cast was a gigantic process. Two stadiums, Pau Negre and Pista Athetisme, located across the street from the Olympic stadium, were the cast dressing and green rooms. The athletes assembled in Pau St. Jordie, next to the Olympic Stadium. Stage sets filled the entire playing field and a major part of the north stands. A blue painted tarp which looked like the ocean covered the entire playing field. The main stage was a four-tier circular platform that started on the field level and rose to the upper balcony level. It had a 10'-diameter hydraulic elevator in the center and four giant preying mantis-like lighting towers surrounded the entire structure. Four different lighting companies (Arnold & Richter, Vari*lite Europe, Meteorlites Productions, and Cameleon) illuminated the stage and stadium for television. Eighteen follow spots from Vanco in New York, arranged as nine on each side of the stadium, were run by volunteers, trained on the job. Mr. Estrin decided that the main stadium PA by Philips, used during the games, was not acceptable for a musical event. Bose provided a higher quality amplifier and speaker system instead. A massive distributed system of Bose 402's, 802's, and 302 sub woofers circled the stadium with six different amplifier locations. The one hundred piece orchestra and the world class opera stars recorded their music on tape, lip-syncing during the actual performance. The extensive stage monitoring system, installed buy by Britania Row, insured that everyone was together. They also provided the sound system front end. This included the front of house mixing, stage monitors and distribution of audio. El Camion, a local recording truck parked outside the stadium played back the tapes. Jordi Bonet, the Director of Audio, created the show tapes and submixed in the truck to minimize inputs for the Front of house, monitors and TV mixes. Josep Romance did the TV mix in a studio of Radio Television Olympic (RTO) located in the stadium. RTO provided the pool feed for TV coverage from the stadium and had constructed an entire three-studio TV complex with master control and transmission room. The props department occupied several tents across the street and organized the monsters, ships, costumes, field tarp and hundreds of other items. Among the busiest were the stage managers. Francesca Llabres along with four senior stage managers and an assistant, coordinated hundreds of volunteers and directed the timing of the entire event. Pete Erskine from BEST AUDIO EAST in New York City designed the intercom using the Clear-Com Matrix Plus Digital Intercom system supplied by Erskine-Shapiro Theatre Technology. The opening show ranged from the usual speeches and introductions to a scene simulating the rough sea. Hundreds of cast members swarmed onto the field dressed in 10' diameter wave costumes. A giant ship sailed onto the field and split into three parts. Huge sea monsters attacked it, and after the valiant crew fought they make their way to the stage. Dancers, fashion models, opera stars, platoons of drummers and bands performed for hours in two segments surrounding the entrance of the athletes. In this colossal ceremony, with tens of thousands of cast, crew and athletes, coordination and stage management was the key to a successful event. Radios provided the only communication method during rehearsals. The show started with 150 radios but eventually grew to a total of 275. The local "FCC" had decreed that twelve channels, only one with a repeater, were enough for this show despite our cries of "Impossible!" In addition, the radios, restricted to 1 Watt to eliminate interference, were not powerful enough to reach all areas. Motorola had created special CP300 radios on TV channel eight to ensure a clear channel. It was rumored that Motorola would destroy the radios after the event because no country would allow their use normally. What a waste! The ceremonies' managers very quickly discovered that their effort needed more than the 12 channels and that, without a repeater, radios could not reach all areas of the stadium. After several days of rehearsal and demonstrated trouble in allocating the channel resources, Mr. Estrin convinced the government to allow some additional channels. Alpha Radio in Paris France rented additional radios to the event. Once the crew had installed the intercom system, we further reduced radio congestion by weaning users from the radios onto the hardwired intercom. This intercom system was massive. There were 15 digital master stations, 19 PL channels and interfaces to two different sound systems and the RTO studio intercom system. Over 140 users had headsets and beltpacks in the opening Ceremony. The way that we used and set up this system is a good example of how to deal with some significant communication difficulties. There were many different departments: stage management, lighting, lighting technicians, Sound, Bose speakers, special effects, pyrotechnics, props, producers, intercom, TV audio and video. Each had least one PL channel and some as many as five channels. A crowded channel makes clear communication on an intercom system hard. Limiting the number of persons talking on any one channel allowed people to talk one at a time and be understood. The users of a channel should have only one function that they are talking about. For example, the Bose technicians had a PL at each of their six amplifier racks. No other department had access to their intercom channel. Another department was stage management. 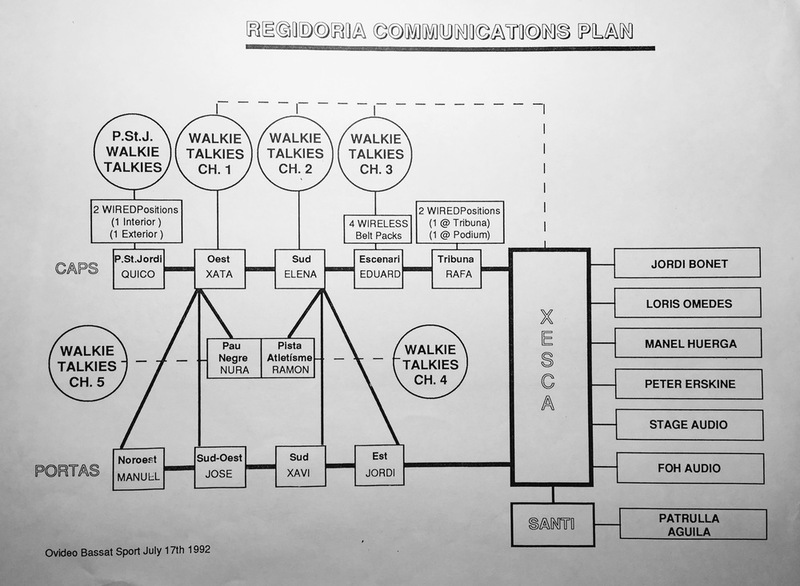 The chart called The Regidoria Communications plan illustrates this complex arrangement of PL channels. The production stage manager, Francesca Llabres (XESCA) had a Clear-Com Matrix ICS-2000 display station with access to many persons but she mostly talked on two channels: CAPS and PORTAS. The CAPS (captains) channel had a total of five other persons on it. They were responsible for getting the cast to the correct station in the stadium. The PORTAS(doors) channel went to four assistant stage managers who were cuing the cast through the "doors" into the stadium. Extensive use of two channel belt packs (RTS BP325) allowed a person to monitor one channel while talking on another. In the above example, the first channel was either CAPS or PORTAS. Channel two on the West (Oest) and South (SUD) CAPS belt packs and all of the PORTAS belt packs was called either CAST E. or CAST W., depending on which side of the stadium they were located. This way the CAPS and the PORTAS talked to each other on channel two without bothering XESCA, the production stage manager. In addition the CAST East and West channels were routed to the Pau Negre and Pista Athetisme stadiums where the cast was waiting to go to the Olympic Stadium. The aim of this arrangement was to keep communications going. The head stage manager talked to all secondary stage managers while that they were talking to their assistants. Conceptual plan by the Stage managers on how the intercom system should work. I wish all production teams would create such a clear plan for comms. In this stadium, the audience was very close to many technicians and the Bose speaker system could produce very loud SPL. Almost everyone has experienced the difficulty in hearing while talking on a telephone in a noisy location. The same way, noise around a user can make it hard to hear on some headsets. Headset selection was not only dependent on the amount of noise at the user's location, but whether the station was mono or binaural. Pyrotechnics stations had TELEX PH10 or David Clark headsets with noise canceling microphones for maximum noise control. Stage manager positions on the field also had the PH10 headsets since the crowd and the sound system was very loud where they were standing. The lighting operators in the booth used the RTS BP325 belt packs. They listened to lights (LITES-channel one) in the left ear and light technicians (LTECH-channel two) and program (PROG-aux I/O) in the right ear. RTS 424 distribution amps fed the program to the belt pack AUX I/O inputs. The BP325 belt pack has a separate volume control on the bottom for this input. The headsets were double ear Beyer DT109 with separate ear feeds. In some locations, where users had to use radios and headsets, the PH10 dual ear headsets would interfere with hearing the radios. The radio audio, inserted into the AUX I/O local program input, allowed the person to hear the radio while wearing the headset. Remember the example of using a telephone in a noisy area? If you cover the mouthpiece instead of putting your finger in your other ear, you can hear clearly. The noise entering the microphone is the problem. Noise picked up by the headset microphones on the follow-spot intercom channel required special attention. As important as it was to block out noise from the ear with a noise sealing headphone, extraneous sound picked up by an open microphone was just as damaging. All eighteen spot operators would be volunteers and trained on the job. Consequently we selected Clear-Com RS501 Belt packs with Remote Mike Kill (RMK) capability. The Follow Spot Stage Manager had a button to kill or turn off all microphones in the Private-line if necessary. As it turned out, the volunteers liked talking so much on the intercom that lighting stage manager needed to use the RMK to get a cue in edgewise! We programmed all other beltpacks in the stadium for momentary on/off microphone control. This prevented the forgotten live microphone. Noisy lines caused by the rain and metal belt packs touching a ground causing a buzz were two of the most common electrical problems. We have found that careful design of the wiring layout simplifies the tracing of problems. Wiring of the four stadia required a massive effort. We used almost 81,000 channel/feet of cable (12,000' single core, 2000' three core, 2000' four core and 5,000' eleven core). The heart of the temporary cable plant was the BEST AUDIO 11 channel multi cable system by Wireworks. From seven locations in the Olympic Stadium, a multi was home run to the control booth. Each circuit of communication took a direct path to the main control booth. Our objective was to minimize patching and splitting of a circuit in the field. The system operator could pin down any noise or other trouble to a specific cable or location while staying in the booth and do software changes and repatching for instant configuration of even the smallest part of the system. 1. The main control positions were all over the stadium. Each required master stations which could access most of the separate communications circuits. Two locations were as much as 2500 hundred feet from master control. Matrix Plus master stations require only a single twisted pair wiring (2-way audio and data/control are fully digital), greatly simplifying system cabling. 2. The system would need to connect to 19 stations of Party-line communications, one channel of RTO 4-wire intercom, two dial-up telephone lines, three radio channels, requiring "Push to Talk" capability, and five audio inputs from various sources. The Matrix Plus provides a modular interface system to make all these interconnections correctly, quickly and easily. 3. We could configure the master stations quickly to specific users' needs. Also while system and station configuration was generally done from a Librex 386SX lap top computer, operators could configure a station and do system-wide programming from any master station. This enabled quick and timely modifications during the production. It was not necessary to return to the control booth. 4. Reliable operation of the Matrix Plus was important to the success of the entire production. The redundancy and "HOT" patch ability of all system components and "Self-initializing" capabilities in the Matrix Plus intercom system provided a very high level of dependability. In a massive show like the Olympics, there are bound to be problems. Hundreds of different vendors try their best to coordinate their efforts but Murphy's Laws always apply. We had two particularly nasty incidents. During the main Olympics many television, radio and electronic media companies covered the events. The Olympic committee, trying to avoid confusion, had each company get prior approval for all cable routes. They assigned different cable hooks in the more congested areas to specific vendors and functions. This simplified installation and avoided many possible problems. The Committee scheduled the Paralympics at the same stadium as the regular Olympics three weeks after their closing. Unfortunately the Paralympics is not covered by the media with the same fervor as the Olympics. Every television and radio company struck their equipment after the Olympic Closing Ceremony. We were staying for the next event and leaving all of our equipment in. We labeled each of our boxes and cables with a laminated tag every 50 feet, showing that these cables would be staying and belonged to BEST AUDIO. Unfortunately our labels were in English and not Spanish! The main TV pool feed for the venue had planned to leave the cable for salvage. They instructed a crew to cut off all connectors from cables in the stadium. They thought that all other cables besides theirs had been taken out. Luckily the Paralympics Ceremonies production staff requested that we return a week early to begin rehearsals. The Intercom had worked well in relieving the load on the radio channels and the wanted to start using it again. When Craig Lilley, the A2 for intercom, arrived on the site he found that someone had cut off all of our XLR connectors and three eleven-pair multies. They didn't get their intercom that week and we worked several long days to restore the damage. The second problem was with our RTS 2100 wireless stage manager frequencies. Telex retuned the system to a "clear" frequency. The "FCC" assigned a special frequency for our use. Everything was OK for the Olympics' Opening Ceremony. However, Murphy's Law decreed that the local security staff would retune their radios to step on us. The slowly moving bureaucracy of the local "FCC" was not able to convince the stadium to change, although the frequency was officially ours! We used wired stations. With attention to these pitfalls in the design and use, the system worked almost flawlessly. We could add last minute beltpacks and master stations easily because we could patch in circuits almost anywhere in the stadium. The crew could fix troublesome noises and user problems quickly because the main operator could isolate them to a particular line from one central location. Users learned that they could quickly configure the system the way they wanted it making their job easy and much less stressful. The names in quotes are the labels that were used on the ICS-2000 display station screens. The numbers in parenthesis are the total belt pack stations on that line. (4) "CAPS" Captains - second level stage managers at 5 key areas in the stadium. (8) "CASTE" Cast east - third level cast member control--east side of the stadium. (8) "STAGE" Third level stage managers on the main stage using the RTS 2100 WIRELESS stage manager systems. (2) "PRDCR" Executive producer - located in the control booth. (8) "LITES" lighting cue channel at 5 positions in booth with program in aux. audio input of RTS BP325 belt packs. (7) "HLITE" House light control - located under the stadium stands and outside stadium street lights. (26) "LTECH" Lighting technical channel - at all dimmers and Follow spots (also shows up in channel 2 of LITES belt packs in control). (16) "'PYRO" Iso channel to cue fireworks to a pair of Clear-Com RS501 belt packs at each of 8 firing locations with sound isolating TELEX PH10 headsets. Clear-Com Matrix Plus system. Serial no 3 and first matrix ever used on a live event by Erskine-Shapiro Theatre technology. "TEL-1" Reserved for dial in by the Atlanta staff in the United States during closing ceremonies — Atlanta segment. "TEL-2" Used by producer and BEST audio personnel for monitoring and back up dial out from Matrix Plus ICS-2000 Display stations. "PATCH" A circuit to feed any audio signal into the intercom system "on the fly"
Telco supplied ring down From control booth to airport for fireworks and balloon release coordination with air traffic control. BEST AUDIO ring down Between the "Carpa" and the "Picadero" dressing room tents. Thirty station centrex style telephone intercom with direct 5 digit access to Matrix Plus system. 175 Motorola CP 300 radios from the Olympic committee with 12 channels and 1 repeater. Seventy five additional MT-1000 radios. 70.7 Volt paging systems (125 Horns) along all cast and athlete routes from the other stadiums for control and cueing. Five station RTS 810 Point to point matrix system installed for backup (But not used).